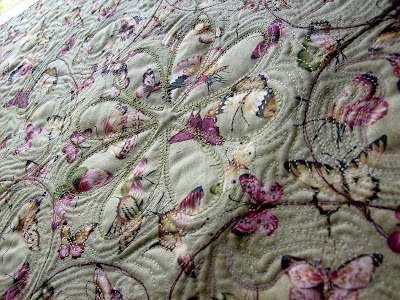 I have now finished all of the quilting on my DQS6 quilt. Now I just need to attach the quilt label to the back (which I just made yesterday using a product that is new to me, I feel a product review coming on!) Lastly I need to make the binding and attach it (Lolly I think you are rubbing off on me!) 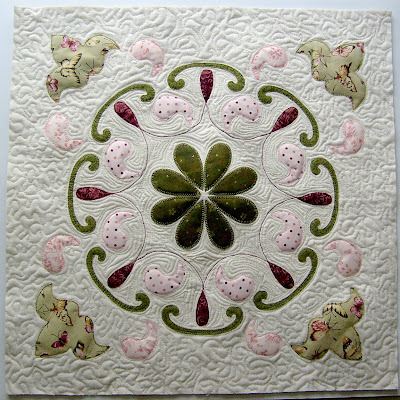 Then my lovely little quilt will be on it's way to my swap partner. Remember that stain i talked about in my previous post? Well I ended up cutting most of it off when I squared up my little quilt. There is only a small stain left now, but most of it if not all of it will be covered by the binding. Don't worry I still plan on using a special technique on the center flower that can be used to cover up a stain. This is awesome! 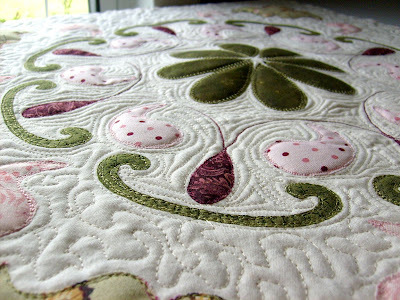 You did a beautiful job with the free motion quilting! Glad you figured out the tricks and bumps. It looks so nice.